Visit Stirling Youth Hostel at Erskine Marykirk. 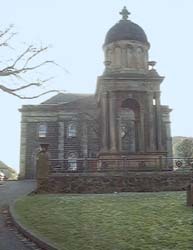 The original Erskine Kirk was founded in the 18th century amid local religious upheaval. The 1740 church was replaced in 1825 - 6 with a new church which was almost totally destroyed by fire earlier this century. The surviving facade has been incorporated into a modern youth hostel. The tomb of the church's founder ( the Reverend Ebenezer Erskine ) lies in front of the church and is overlooked by an elaborate classical monument. Four star VisitScotland accredited Stirling Youth Hostel is set in the grounds of stunning Erskine Church, just a short walk from historic Stirling Castle, high above the town centre, with magnificent views over the surrounding area.